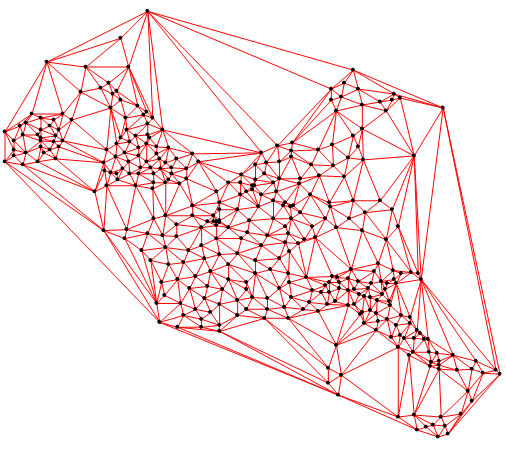 Delaunay triangulations are widely used in scientific computing in many diverse applications. While there are numerous algorithms for computing triangulations, it is the favorable geometric properties of the Delaunay triangulation that make it so useful. The fundamental property is the Delaunay criterion. In the case of 2-D triangulations, this is often called the empty circumcircle criterion. For a set of points in 2-D, a Delaunay triangulation of these points ensures the circumcircle associated with each triangle contains no other point in its interior. This property is important. In the illustration below, the circumcircle associated with T1 is empty. It does not contain a point in its interior. The circumcircle associated with T2 is empty. It does not contain a point in its interior. This triangulation is a Delaunay triangulation. This presentation discusses how to extend 2-D Delaunay to 3-D Delaynay. One of the greatest advances in theoretical physics of the nineteenth century was Maxwell’s formulation of the the equations of electromagnetism. This article uses differential forms to solve a problem related to Maxwell’s formulation. The notion of differential form encompasses such ideas as elements of surface area and volume elements, the work exerted by a force, the flow of a fluid, and the curvature of a surface, space or hyperspace. An important operation on differential forms is exterior differentiation, which generalizes the operators div, grad, curl of vector calculus. the study of differential forms, which was initiated by E.Cartan in the years around 1900, is often termed the exterior differential calculus.However, Maxwell’s equations have many very important implications in the life of a modern person, so much so that people use devices that function off the principles in Maxwell’s equations every day without even knowing it.